Paving the way for a new emphasis on web content, Master has completely overhauled their website. 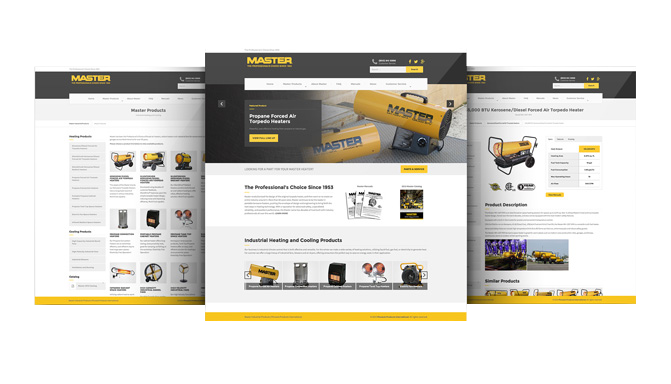 Focusing on high quality images as well as deeper information on products and company history, the new Master website aims to give consumers an enriched experience. Ongoing, the plan is to implement a wide array of video content to aid in both product promotion and customer service. With step-by-step details on maintenance and troubleshooting, these videos will bring Master’s hands-on customer service expertise to consumers right where they are, 24/7. — Jim Brower, CEO of Master’s parent company, Pinnacle Products International. The Master name is built on decades of trust with industry professionals. Master has been a leader in the portable industrial heating industry for over 50 years, and continues to innovate within the field. A driver of technological progress, Master strives for excellence in performance and durability with all of their heating and cooling products. Hello Cliff, you can either call customer service at 800-641-6996 , or fill out this form on the Master website http://masterindustrialproducts.com/customer-service/. Someone will be happy to assist you. My pro temp heater won’t light it just blows black soot and never lights . Hi Douglas, we’re sorry to hear you are having problems with your heater. Please contact our customer service team at 800-641-6996 and someone will be happy to assist you. Hi Phyllis, our phones were unfortunately down yesterday, please trying calling again today, or send us an E-mail through http://pinnacleclimate.com/contact/. hi i have protemp heater model number pt-18-pch serial number HCH09015337.LOOKING FOR REPAIR LOCATION I LIVE IN CHICAGO 60639. You can type in your address or zip code here: http://pinnacleclimate.com/service-centers/ and you will see a list of service centers near you.